The research, led by Jay Farrell, professor and chair of electrical and computer engineering in UCR’s Bourns College of Engineering, was published recently in IEEE’s Transactions on Control Systems Technology. The approach involves reformulating a series of equations that are used to determine a GPS receiver’s position, resulting in reduced computational effort being required to attain centimeter accuracy. Differential GPS (DGPS), which enhances the system through a network of fixed, ground-based reference stations, has improved accuracy to about one meter. But meter-level accuracy isn’t sufficient to support emerging technologies like autonomous vehicles, precision farming, and related applications. “To fulfill both the automation and safety needs of driverless cars, some applications need to know not only which lane a car is in, but also where it is in that lane–and need to know it continuously at high rates and high bandwidth for the duration of the trip,” said Farrell, whose research focuses on developing advanced navigation and control methods for autonomous vehicles. Achieving centimeter accuracy requires “GPS carrier phase integer ambiguity resolution.” Until now, combining GPS and IMU data to solve for the integers has been computationally expensive, limiting its use in real-world applications. The UCR team has changed that, developing a new approach that results in highly accurate positioning information with several orders of magnitude fewer computations. “Achieving this level of accuracy with computational loads that are suitable for real-time applications on low-power processors will not only advance the capabilities of highly specialized navigation systems, like those used in driverless cars and precision agriculture, but it will also improve location services accessed through mobile phones and other personal devices, without increasing their cost,” Farrell said. Police agencies are using Geographic Information Systems (GIS) for mapping crime, identifying crime “hot spots,” assigning officers, and profiling offenders, but little research has been done about the effectiveness of the technology in curbing crime, according to a study at Sam Houston State University. According to a 2001 survey by the National Institute of Justice, 62 percent of police departments with over 100 officers use GIS systems. Collectively, the technology has been credited with reducing crime, decreasing residential burglaries, tracking parolees and serious habitual offenders, and identifying “hot spots” with high concentrations of crime. There are four major uses for GIS in policing, the study found. Crime mapping identifies the geographical distribution of crime to deploy officers to “hot spots” of activity and to develop other intervention plans. Many departments have developed computerized statistics or CompStat systems to help manage the decision-making process. The system assists with instant crime analysis, deployment techniques, active enforcement of trivial crimes, monitoring of emerging patterns, and accountability programs for law enforcement managers. GIS also is used to create geographical profiling of offenders, an investigative method that allows police to identify locations of connected crimes to help determine where an offender may live, particularly in serial cases. While these practices are widespread, especially in larger departments, little research is available to measure their effectiveness in policing. Current studies indicates that GIS is used mainly to aid in the design of policing strategies and/or to evaluate the decision-making processes at law enforcement agencies. Mobile phone positioning data can be used to monitor population movements during disasters and outbreaks, according to a study published in PLoS Medicine. The study, conducted by Linus Bengtsson and colleagues from the Karolinska Institute, Sweden and Columbia University, USA, finds that reports on the location of populations affected and in need of assistance can be generated within hours of receiving data. Population movements after disasters make it difficult to deliver essential relief assistance to the right places and at the right scale. In this geospatial analysis, Bengtsson and colleagues investigate whether position data from mobile phone SIMs (subscriber identity modules) can be used to estimate the magnitude and trends of population movements. The authors collaborated with Digicel, the largest mobile phone operator in Haiti, to retrospectively follow the positions of 1.9 million SIMs in Haiti before and after the January 2010 earthquake, and found that the estimates of population movements using SIM cards were more accurate than ad hoc estimates generated immediately after the earthquake. The authors then tracked population movements by SIM positioning during the first few days of the cholera outbreak that occurred following the earthquake, showing that these estimates of population movements could be generated within 12 hours of receiving SIM positioning data. Their findings show that routinely collected data on the movements of active SIM cards in a disaster-affected nation can provide estimates of the magnitude, distribution, and trends in population displacement, and that the method can be used for close to real-time monitoring of population movements during an infectious disease outbreak. Results of the study also suggest that this method could provide estimates on area-specific population sizes and could lead to important improvements in the allocation of relief supplies. However, this approach may not be effective in all situations, since disasters can destroy mobile phone towers and some areas have sparse network coverage. Additionally, mobile use may be lower in some population groups such as children or the elderly. Drivers were freed from their dependence on maps a long time ago – nowadays they rely on their navigation device to get them to destinations in unfamiliar areas. But this luxury has so far remained elusive for users of local public transport systems. A personal guide – similar to a car’s navigation system – designed to show them the way to their destination and help avoid hold-ups and out-of-service lines would be a tremendous help. 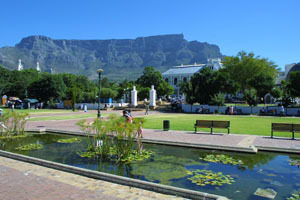 Commuters and locals could switch to alternative routes if their bus or train was late and tourists would be able to find the quickest route to their hotel or to the main city sights. Now it seems there is a glimmer of hope on the horizon for public transport users: Researchers from the Fraunhofer Institute for Transportation and Infrastructure Systems IVI in Dresden are working with eight partners from industry and the research community on the Smart-Way project, which aims to develop a personal guide which would offer a whole lot more than just timetable information. 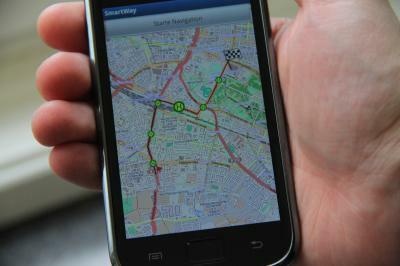 This mobile guide is being developed in the form of a navigation application for cell phones and smartphones. The goal is to make the app available from 2012 to help people find their way through the labyrinths of trains, buses and trams that criss-cross Europe’s cities. The application displays multiple alternative routes on a map which shows all the stops, connections, modes of transport, directions, arrival and departure times. Users also have the option of breaking off their journey, switching to different forms of transport or entering a new destination at any point they wish: By constantly tracking the user’s current location, Smart-Way is able to respond in real-time by simply re-calculating the route. The same applies in the event of traffic jams, delays or early arrivals – whenever new developments affect your chosen route, the app immediately suggests alternatives. A useful touch is the vibration alert that tells you when you have reached your destination or missed a stop. A prototype of Smart-Way has already been completed and the researchers hope to have a final version of the application ready to roll out across Europe by 2012. The first field tests are scheduled to be run in September 2011 in Dresden and Turin in cooperation with the local public transport operators. Bing Maps is not winning over any Google Maps users, but they do develop very useful apps. The link to the apps gallery is bottom left at Bing Maps.